TRENDS OF A BRIDAL BOUQUET! 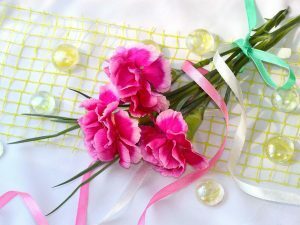 When and where appeared the first romantic accessory, such as bridal bouquet? How to choose the right flowers for a wedding outfit, and right bridal bouquet? For centuries people used to decorate their weddings with flowers, and greenery. 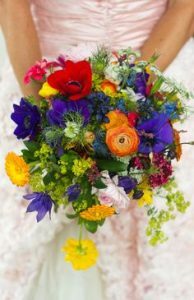 Nevertheless, first bridal bouquet, in bride’s hands, appeared in XIX century only, in United Kingdom on wedding of Queen Victoria, and Prince Albert. As we could say now – Queen Victoria has set a trend in bridal bouquets. Since then, a bridal bouquet is an important wedding attribute. Each of bridal bouquets symbolizes love, passion, affection, devotion, shyness, or attachment. But what bridal bouquet to choose for the wedding, and what trend in now on? If we talk about form of the bouquet, we can say that bouquets, executed in a garden-free manner, are most popular among others and considered as a trend for the last 2-3 years. 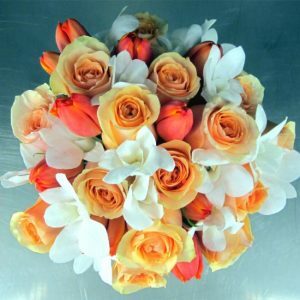 These kind of bouquets are very special, as they can’t be confused with any other traditional bouquet. The most significant characteristic is restrained and negligence embodied in surprising combinations – big splashy bouquets with big variety of flowers and greenery in the composition. This year wild, garden-free bouquets will be even more popular than before. The only difference, comparing to previous years, these bouquets will be even lusher and bigger. These bridal bouquets are perfect for those who are not afraid of big three-dimensional forms, volume, and vivid combination. Our version of a scruffy garden bouquet is Floral Fancy Bridal Bouquet, and Rainbow Bridal Bouquet, with roses, orchids, peonies which became the most popular among our brides. These types of bouquets harmoniously combine the lush texture and soft color scheme, with floral diversity. It incorporates several key trends and can be a great inspiration for brides for the upcoming wedding season. In addition to these disheveled bouquets, often as a wedding theme we can see laconic monochrome combinations. These are a perfect example of a classic wedding. Small in size, light in scale – these bouquets will appeal to more conservative brides or weddings with a traditional style. It is important to note that in spite of its compact size and the monochrome white and green palette of these bouquets continues to inspire by the garden flowers they are not in a form of a ball, and located at different level comparing to each other, and are complemented by greenery. If you are planning to have a wedding, need help in organizing it from choosing a venue to best bridal bouquet – contact Damas Flowers. We are ready to organize your wedding from A to Z, and take care of all details. Damas Flowers is your savior.